Drawing on over a century of family history in southeastern Alberta, Jonathan Koch chronicles the forgotten people and places of southern Alberta, Canada's Badlands region. As any blogger can attest, when you publish content online, you’re never sure where it will end up. Earlier this year, I was pleased to discover several short videos from 2012 (!) that had apparently been inspired by articles published on this site, and on VulcanCountyHistory.com. Who are the forgotten dead of Vulcan County? Leaning and rusting, and surrounded by an ocean of tinder-dry prairie, the last remnants of the long-abandoned farming community of Alderson (nee Carlstadt) teeter on oblivion, awaiting the one spark, lightning strike, or hot exhaust pipe that will erase them from existence. A fire in 2014 destroyed the last structure in the Alderson townsite, and as evidenced by the destructive wind-driven prairie fires that recently ravaged southern Alberta, the next conflagration could come at any time, without warning. A peculiar facet of southern Alberta’s pioneer-era history is that there is little permanence to it. While we tend to adhere to an old world bias that history involves a permanent physical and literary record, neither of these exist throughout much of the plains. 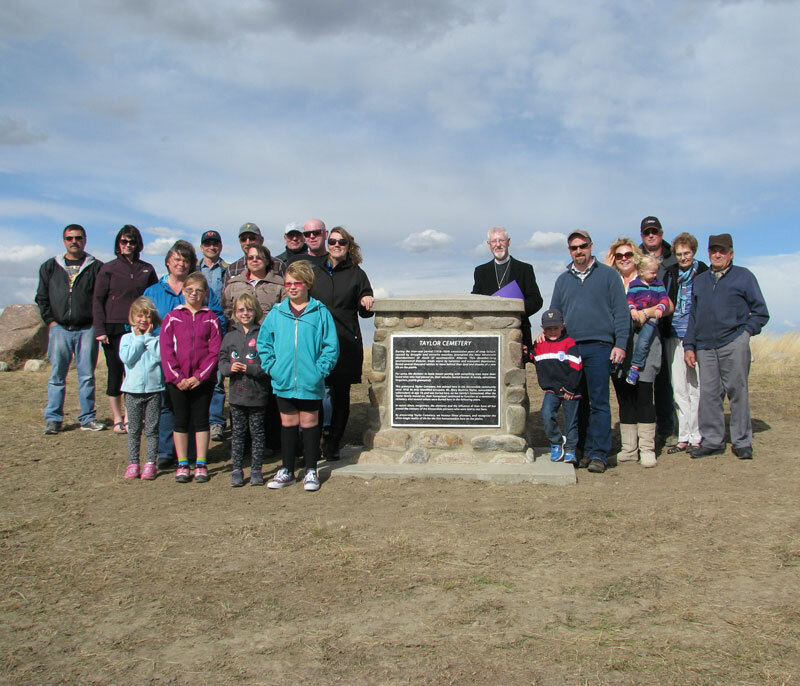 Much of Palliser’s Triangle was settled and abandoned a century ago, and with the pioneer exodus went the stories of hope and heartbreak, which were quickly forgotten as new lives were built somewhere else and generations passed on. Inevitably, the physical evidence of the homestead experiment is fading, with man and Mother Nature working in consort to set the clock back to zero. In time it will be like they were never here at all. Thankfully, the memory of Alderson (nee Carlstadt) at the peak of the settlement boom was chronicled in great detail by photographers, Chester Coffey in particular. 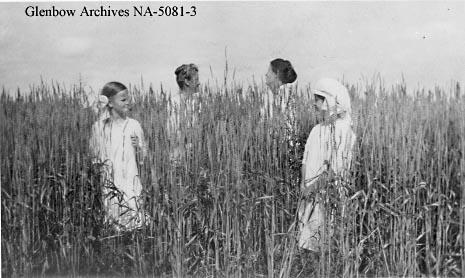 The Starr family seems to have been a favoured subject, and several photographs documenting their presence in the community now existence within the province’s archival collections. C.F. 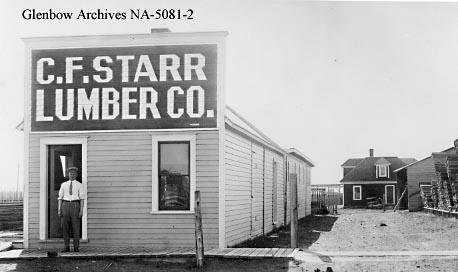 Starr lumber company, Carlstadt, (later Alderson), Alberta. From the David C. Jones’ Carlstadt / Alderson Photographs collection, Glenbow Archives, Calgary. Carlstadt (Alderson) views, Starr Lumber Co. (2), and two residences. From the Medicine Hat Chamber of Commerce fonds, Esplanade Archives, Medicine Hat. Bumper crop on C.F. 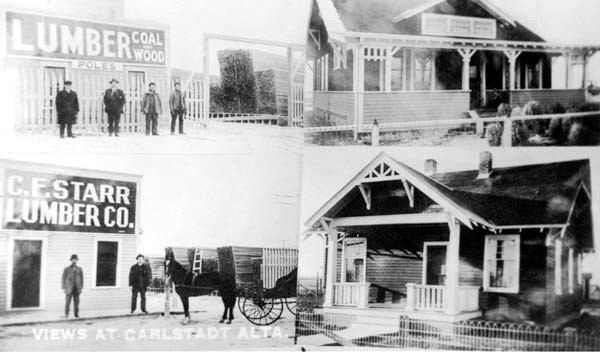 Starr farm, Alderson (formerly Carlstadt), Alberta. From the David C. Jones’ Carlstadt / Alderson Photographs collection, Glenbow Archives, Calgary. “Alderson National Forest”, then and now. Highway 25 north of Lethbridge is mostly known for one thing: cows. This is heart of “Feedlot Alley“, the highest concentration of intensive farming operations in Alberta, which produces over half of the beef consumed in Canada. While industrial farms dominate the landscape today, the area’s roots are deep underground, in the rich coal seams that run along the Oldman River. Underneath silage pits, cattle pens, and pivot tracks lie a rich heritage of boom towns, ghost towns, and a pioneer history dating back over century.